Plenty of misconceptions exist about night driving, and night driving eyewear is a highly sought-after product. In addition to some significant considerations to keep in mind, drivers must realize that there is no catch-all solution. Before trying night vision eyewear for driving, be sure to employ the tips provided in Shedding Some Light on Night Driving Challenges and Solutions, Part 1 as well as the additional tips offered by the AAA Foundation for Traffic Safety. If night driving eyewear still interests you after considering the other options available, keep in mind the following points regarding eyewear that may or may not improve night vision. There are two main reasons people look for night driving glasses. First, they want to enhance contrast and depth perception in dim light. Second, they want to reduce glare from oncoming headlights. 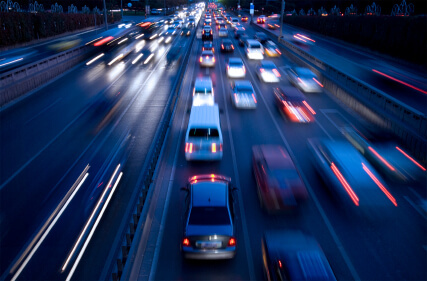 However, can lens color provide any solutions to nighttime driving vision problems? Let’s find out. Improving contrast and depth perception when driving at night can only be achieved during the few hours before and during dusk or at other times that are dim without being dark. A yellow/amber lens can brighten surroundings using the small amount of light available. However, these lenses require the presence of some light since benefits are lost when darkness fully descends. After dark, not much can help improve visibility. Even with the possibility of a yellow/amber lens improving visibility for some people and in some conditions, the use of any tint once dusk hits are controversial. One of the most common complaints when it comes to night driving is headlight glare. Which leads to a common question. What lens features or color will help reduce headlight glare? First, let’s dispel some common misconceptions about eyewear and headlight glare. Polarized lenses will help with headlight glare. False. The glare caused by the headlights of oncoming traffic is different than the glare generated by the sun so a polarized lens will not offer the same benefits against headlight glare. Plus, polarized lenses typically use dark lens tints, which dramatically reduces visible light transmission. Which means your night vision would be reduced to nearly zero. Eyewear with mirrored lenses will reduce headlight glare. False. Unfortunately, this type of lens is neither practical nor advisable in the dark. Even an indoor/outdoor lens which features a light mirror coating over a clear lens only allows 50-60% light transmission. Obviously, this presents a danger with the already dark conditions of nighttime. Wearing eyewear with an anti-reflective coating will reduce headlight glare. Partially True. Prescription eyewear with an anti-reflective coating will slightly reduce headlight glare. However, non-prescription eyewear with AR coatings is still not recommended. Tinted lenses may reduce glare, but they also darken your entire surroundings. Vision Experts advise customers to “please choose wisely,” and to cease using any lens if it impairs vision. Everyone must realize there is no perfect or ideal type of night driving glasses. There are just too many variables. A person’s sensitivity to light, natural ability to see in the dark, varying environmental light conditions and driver objectivity have to be considered. The bottom line is, having perfect vision for driving at nighttime just isn’t possible. However, the night driving tips we suggested in Shedding Some Light on Night Driving Challenges and Solutions, Part 1, and listed below will provide the most significant improvements to nighttime driving and battling with headlight glare. Here’s a quick overview. Clean your eyewear lenses, windshield, and headlights. Use anti-reflective coatings on prescription eyeglasses. See your eye doctor when you first experience night vision problems. 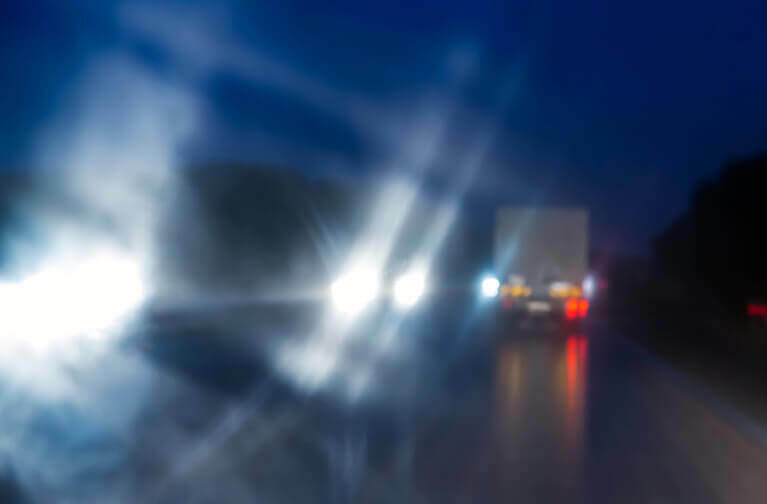 Should you choose to experiment with night driving glasses or even with various lens tints, know that eye experts warn against this as a safe option. Do you have any questions or comments? Please leave a comment below. I really was in the mind of buying two pair. One for each of us! You saved me $60!! Thanks. Thanks for leaving a comment. I’m glad my article helped save your hard earned money. Thank You! for the correct information. Can be the advertisements mentioning ‘night vision glasses’ called a case of misleading customers? Yeah, I found that out too, the yellow tint is a waste of time. We’ve received lots of positive feedback from customers who wear the Elvex Bifocal Go-Specs while riding a motorcycle. The bifocals allow them to see their bike’s instruments and the foam gasket blocks the wind and debris. Thanks for the info! Truck driver by trade and over 60 now I was also looking into tinted glasses. I do wear glasses full time and for night driving have a pair of clear lenses with an anti reflection coating. Looks like I already have every thing I need. You saved me the price of a pair of prescription glasses. Keeping every thing clean and not looking into on coming headlights as well as keeping your dash lights dim. Covers it all I guess. Thanks again. Thanks for leaving a comment Bill. It appears you’re doing everything right and I’m happy this article saved you some hard earned money. Stay safe. The Bolle Rush Safety Glasses with their HD Hydrophobic Lenses are exceptionally clear. When it comes to clear lens quality Bolle’s HD lens is hard to beat. I had cataracts removed and have really great vision with the Symfony lens implants. I no longer need prescription glasses. But at night lights have “rays” shooting forth around them. Any suggestions for helping to cut down that glare? Thank you so much. First, I’m happy to learn you no longer need prescription glasses, that has to be a major relief. Unfortunately, I don’t have any experience with cataract surgery. I recommend talking to your eye care provider and see what they recommend. Thank you for the nice words. I hope your eye doctor can give you some good news. Thanks for the article,but I’m still looking for something to wear at night while riding my motorcycle. I’m still torn about the yellow timt versus the clear. I have no medial issue with sight just want to be able to see enter and keep the wind out. What do you recommend??? You have read the article, so you already know about the benefits and drawbacks of Yellow lenses, Indoor/Outdoor lenses, and virtually anything that’s tinted. A lighter but effective alternative to your typical Indoor/Outdoor lens is the CSP lens from Bolle. At 63% light transmission, it offers better visibility while still reflecting much of the glare. The perceived light transmission is higher than the technical value, in my opinion. That is, it offers better visibility than the transmission percent would suggest, and the rest of the benefits are there. This lens also has an excellent anti-fog coating. Clicking here will show you the results for a “CSP” search on our website. The Silium Plus is the lightest in weight and offers the thinnest temples for under-helmet use. The Baxter will provide the best wind seal, but may not be as comfortable with a helmet. The wrapping Rush Plus is the most popular for general use. Yellow is still an option for a glare related problem for some people. While it won’t offer the same reflecting benefits of those mentioned above – there is no mirror coating on yellow/amber to help reflect – it is just slightly dimmer than Clear (technically), and may still offer the “brightest” perceived view. But a Yellow lens does not solve the glare problem for many people. Unfortunately, there’s no way to know if it will help you without trying it first. In any case, one thing all experts agree on is that if one determines that any lens impairs or darkens one’s vision too much, he or she should cease using the lens in that environment immediately. Regarding styles, some riders like Goggles, some prefer Glasses, and some like the ability to switch to either. We often call them Convertibles. They come with temples and a goggle strap and are easily changeable to either format. You’ll find that many of these convertibles are also in the Motorcycle Goggles category that is linked above. On any of these pages, use the filters on the left margin to get more specific with your choices. I hope this helps. Safe riding. Thinking about this glasses and based on what I know about how the eye works, I though that the principle on which yellow tint glasses are based on is that when you get the light from other cars, the pupil closes to protect the eye, and the yellow tint reduces the shine from the light, so the pupil can stay more open so the eye will receive more light. Isn’t it happening? I know Formula 1 drivers use yellow tint visors on their helmets during night time races like Singapur, so I suppose somebody is recommending them to use them. I think the theoretic fact about the open pupil should work but I’m not sure if the actual yellow tint glasses do it. Can you provide some further information about it? Fair question, Almarma, and it’s the reason there is still uncertainty about this topic. Logically, what you’re suggesting makes sense, but it doesn’t exactly work that way. It’s pretty common knowledge that a yellow or pale amber lens will give the perception of brightened surroundings. This makes people think that yellow will brighten any view, even during dark night driving. This, combined with the thought that some tint (non-clear) will block glare, made these lenses seem like the answer. There are a couple misconceptions with yellow lenses, however. While they appear to brighten your view, they will require at least some ambient light to achieve this. In a dark environment, no tint will actually lighten your view for real. Also, yellow lenses don’t block as much glare as some think. We don’t have a good method for empirically measuring this, but yellow doesn’t block enough glare to help significantly. The light transmission of clear lenses is usually 88-94%. Some lenses will get you 96%. Yellow lenses can also get up to or near 88%, meaning the difference in light transmission between clear and yellow is minimal. Yellow will block some blue light, however. Since blue light scatters more with its shorter wavelength, it can impair the sharpness of one’s view. Therefore, blocking blue light can improve sharpness. So yellow’s claim to fame is that it is the lightest color (lets most light in) that will block (some) blue light for a sharper view. Thank you Sir for your military service and informative article. A brain injury left me with no depth perception and loss of peripheral. I’ve been having great difficulty at night driving. I was considering night glasses, but after reading this article I’ve decided to stop night driving all together. I can handle driving at night in town, but not interstate or rural roads. This article re-affirmed what I already knew but didn’t want to believe. I will not be night driving for safety issues for myself and other drivers. Blessings to you! Thank you for the kind words, and I’m sorry to learn of your condition. Regarding your night driving, it sounds like you’ve made an informed decision and chose safety over all else. Kudos and blessings to you. Most of my social life is at night! I am 72 and this glare issue started post cataract surgery 5 years ago. I do not recommend Toriq replacemant lenses. Medicare approved lenses seem the best.It seems highway driving is not a problem but driving in a town is treacherous. The glare is truly debilitating and not safe for people in my path. The new LED lights are also an issue. The company that can solve this problem will be a billion dollar success. Yes, Lynn, you’re right, there is definitely demand for night-driving lenses that work. I definitely dislike night driving on 2 lane roads without streetlights, especially hwne there is one car after another 1) It seems that newer headlights are brighter and more likely to cause temporary blindness. 2) Blue-eyed people tend to constrict their pupils more and let less light in. 3) I noticed my headlights were not lighting up reflectors very well, so besides c;eaning head lamps, I will have the aim adjusted. Thanks for covering this topic. You’re welcome, Jim. Thanks for following us. Yes, we’ve considered that night vision technology could possibly be incorporated into basic eyewear somehow, but it must all be affordable and widely available. I can tell you I have seen these for years. I thought they where scams. My friend had a set and allowed me to try them. Where I can see that they slightly reduce visibility, I believe the pros out weigh the cons. I feel much safer with these on. I am typically blinded by the new ultra bright lights. As I age, I can not refocus quick enough to see the road. So if I have car after car of headlight to get past, these allow me to constantly see the road. When no other cars are on comming, I personally can see a reduction in visiblity. But to say they do not help vision against the on coming cars I disagree with. I am excited that finally I can see the road. I can deal with glare it’s the new ultra bright lights that blind me. No more being blinded with these. Thank you for reading and for your comment. I don’t know to which specific glasses or lenses you refer, so I cannot speak about those directly. I should clarify that we did not suggest glasses do not help with vision or glare for oncoming vehicles, but it needs to be understood that there are a several variables to consider, and no solution works for everyone. Additionally, while some lenses do absolutely help with light brightness and glare, those same lenses will often (usually) reduce visibility elsewhere. As it is not practical for a driver to don glasses only when vehicles approach, one must wear something that also provides adequate visibility in the moments when no other traffic or lights exist, and therein lies the dilemma and challenge. I drive truck and have found and others may have seen truck drivers leaving a light on in the truck to keep us from getting tired. The light on keeps the eyes dialated so there not straining and making us tired. I understand the dilemma there, Eade. To clarify, the eyes are more dilated (pupils are larger to let light in) when the light is off, but I see where you’re going. I would think you’re better served to have the light off in the cab, especially at night. Any light in the cab will also create a negative contrast during night driving, significantly reducing visibility. Your best solution, especially during medium to bright light conditions, is invest in a pair of good sunglasses. I recommend polarized to reduce the glare, and also a tint like brown or copper that reduces blue light transmission. No joke – polarized brown or copper lenses, and your eyes will thank you over and over. Holocomb, that will likely depend on your platform. We can manually code, or we can use a handful of basic buttons to drop the code in place. I have prescription glasses and prescription sunglasses. I recently got my US driver’s license and night driving scares me. My night-vision isn’t very good to begin with. I currently live in a city with very few street lights. If cars are coming toward me from the opposite lane I can’t see. Rachel, it’s a shame that there isn’t a perfect solution for this problem. Many people share your struggle. It is plausible that reduced lighting makes the glare seem worse. Your pupils are likely dilated somewhat to allow more light in when it’s darker around you. The oncoming lights will then seem brighter. It’s difficult to find a lens that works for someone at night — no lens works for everyone — and this article addresses that issue. Options in over-the-glass styles are even harder to come by. There are links to two lens groups here, Amber (yellow) and Indoor/Outdoor. Neither is a true anti-reflective option, but the I/O has a light mirror coating to block additional light. Please note that any lens tint technically reduces all the light coming to your eyes, not only oncoming headlights. If you find that any lens is too dark to see adequately, you should immediately cease using them. I am not aware of any prescription night glasses at this time. Thanks for the education. You’ve saved me a great deal of money. Over here where I live, I would have had to pay twice the average cost in the US. I wear prescription lenses and had been looking into buying yellow-tinted wrap arounds to wear over them at night. I used to have excellent night vision but for the last one year or there about I have noticed a great reduction in my visual accutity. Guess it has to do with aging. Thanks for the feedback, Oba. We struggle with that as well. This is Jeff at the Iowa Greyhound Park I announce races for a living but I’m having trouble distinguishing the blanket colors at night…. However keep in mind a possible solution would have to consider that we do have lights on the race track this is an unusual situation aside from surgery of some kind any suggestions? Thank you for your question, Jeff. As I get older, I’ve noticed my color recognition has diminished especially in low-light environments. It’s possible an anti-reflective lens coating may help, but there are no guarantees. I would avoid using tinted lenses as that would only reduce the amount of ambient light you’re eyes are receiving and could distort the blanket colors even more. In my opinion, your comment about using the race track lights is probably the best solution. This might seem like a stupid question but why can’t truck drivers who drive overnight wear night vision goggles like the military have to see better while driving? That’s an interesting idea, but in my opinion, wouldn’t work in practical application. In my experience (which is limited), night vision goggles are designed to gather as much light as possible to render an image. This extreme light sensitivity would make oncoming headlights, streetlights and other forms of artificial light blinding or cause the goggles to turn off. Plus, most NVG’s only project an image in a single color, either green or black and white so you would lose most if not all of your color recognition. I just found your article. I am night blind and wear contacts. I suffer from migraines and have to be careful of the glasses I wear. I got really excited when you mention the clear glasses then clicked on the link and saw how bulky they are. I just started driving for uber which was a great accomplishment for me between all of mine and my daughter’s doctor and PT appointments as I’ve been trying to find a job any job for the last 2 years in my field that fits into our schedule with no luck, now that they have my headaches under control Uber is it but I can’t drive at night since I want to keep myself and the passengers safe. I can’t tell you how many of my friends have tried to get me to buy those glasses and I could tell by looking at them that it would impair me more, and several friends thought I was making an excuse not to drive at night. They are too dark. I’m night blind. Besides the glare, it’s dark roads. So I’m going to google to see if I can find some lighter frames. I live in Las Vegas and drive on the strip. That would give me at least an hour after dusk I bet. Thank you for your comment, Mary. I hope my article was helpful. I have a problem that I don’t see mentioned here or in other sites about night driving. From October to May, we get mainly rainy weather so there’s a lot of reflected light from wet road surfaces and tiny raindrops on my windshield (that act like hundreds of mini-lights between swipes of the wiper blades). In city driving, street lighting makes night driving acceptable for me if i know the route but on highways, I find it difficult. Add to that, pickup headlights are high enough and angled so they shine directly at my eye level. It also seems that many opt for extremely bright blue-white headlights now. It may help them see better at night but makes it worse for me especially on the frequet rainy nights. I know good wiper blades and a properly cleaned windshield make a difference but the finer dirty road spray from passing vehicles means I need to frequently use the washer spray to try to keep it clean. I try to limit any night driving but don’t always have a choice. Do you have *any* other suggestions that might help me, please? Hi Jude. Thank you for your question. Honestly, I feel your pain. Driving at night, in the rain is a real struggle for me, especially on freshly paved roads. The two tips that have helped me the most is keeping the inside of my windshield clean and turning on my fog lights. I’m always amazed at how fast and oily the inside of my windshield gets, especially in the summer months. A good vinegar based cleaner and newspaper will help cut through the grime. Turning on my foglights also helps me because it improves my peripheral vision and depth perception. I can see the shoulder and sides of the roads easier, which is very important if you live in deer country! Plus, your foglights also increase the shadows cast by road debris, which helps you see and avoid running over an object in the road. Hopefully, these tips will help you with the difficulties of driving at night in the rain. I wish I could offer more help. I wear contacts as well as glasses. Would I see better at night wearing my contacts and a pair of clear lenses with anti reflective coating such as Bolle Rush Safety Glasses with their HD Hydrophobic Lenses? I think my glasses do have anti reflective lenses. Thank you for your question, Ruth. It’s possible wearing your contact lenses with anti-reflective eyewear may help you see slightly better at night. Since a persons night vision acuity and light sensitivity vary for every individual, you will have to experiment to know for sure. In my experience, a clean windshield and dimming the dashboard lights improved my night vision more than wearing any type of eyewear. But, that’s just my experience, yours may vary. Thank you for your question, Dean. Its possible a very light yellow tint may help, but I cannot make any guarantees. Personally, I’ve experienced better results from maintaining a clean windshield, especially the inside portion of the windshield, and reducing the brightness of my dashboard lights. However, I have had a few customers inform me that they did have some positive results while wearing anti-reflective lenses or a very subtle yellow tint. I also recommend a visit to your local eye doctor to make sure you don’t have other issues affecting your night vision. Thanks to the moderator for your original post and other comments. It might help some readers to note that yellow lens performance depends on more than light transmission, but also on the exact center and bandwidth of light transmission, and different eyes have different color sensitivities. Thus there are many possible combinations of lenses, and eye structure and performance which will affect user experience. Thus some people are likely to have poor experience with some yellow lenses, but good results with others. I just ordered a pair of yellow glasses. I had a sunvisor with the yellow shade. It may be a difference in eyesight. But the yellow tint helped me tremendously. Glare is bad enough. Even snow glare…or haziness. But just night driving alone is horrid. Rainy nights are worse. And that’s with no headlights even coming at me. And I have brand new glasses. Anti glare lenses have never helped my night vision. With the yellow tint, things are brighter, not dark. Plus it cuts some glare…it mutes the brightness. But to me its like turning on sunlight in the dark. I just can’t drive without it. Thanks for the well written article that shed light to night time driving aids. M-frames hybrid s ordered from your site have served me well. Yut! Thank you for your feedback, David! I’m happy the Oakley M Frames are working well for you. I’ve found that polarising photochromatic lenses have reduced painful glare from ultra bright headlights and had minimal reduction in visibility on shadows. Like others have said, the slight loss in total light is offset by being able to look at lights that would be painful otherwise. The cause of the problem is vehicles with lights that are too intense for oncoming traffic. I’m skeptical the polarization or photochromatic properties of your eyewear had any effect. It’s more likely the darker lens tinting of your eyewear is what caused the increased comfort. Allow me to explain below. Photochromatic lenses require UV light exposure to darken. Today’s car windshields and windows block almost all UV light, so photochromic lenses do not darken while worn inside a vehicle, the lack of UV light is increased even more at night. Plus, photochromatic lenses do not get as dark as ordinary sunglasses. To offset this, manufacturers will add tinting to their photochromic lenses, which means when these lenses are in their clear state, they are still darker than traditional clear lenses. Which is why you noticed a reduction in the brightness of the oncoming headlights. I’ve haven’t seen or read any evidence that polarized lenses help with oncoming headlight glare or intensity (other than the dark tinting of the lenses). Do you have any references to a source that demonstrates this? Please use caution when wearing any type of tinted eyewear for night driving. While the darker lenses may help reduce the brightness of oncoming headlights, they also reduce the amount of ambient light your eyes absorb, thus significantly reducing your overall visibility. I have not read all the comments above, but I can attest that when I was a younger man (younger than 57-ish), I could have readily agreed with the hypothesis that the “amber/yellow lenses actually HURT your night vision”. But as my eyes have become slower to react to reducing the amount of light coming through, due to the night-time glare of inconsiderate folks who seem to have a penchant for adding significantly more lighting to thier vehicles than is legal, (much less necessary), AND/OR having thier lights poorly aimed (or more correctly NOT aimed to legal requirements), I find myself resorting to the use of the amber lenses placed OVER my Rx glasses, in order to be able to drive myself anywhere after sunset, or before dawn. Thank you for your comment, Steve. I agree that the LED headlights on today’s vehicles are incredibly bright and typically aimed too high. Even in my rural town and county, it can make for some hairy moments when you’re blinded by the oncoming traffic on our narrow back roads. I do however want to remind everyone to use caution before wearing any tinted eyewear for night driving. While the tinted eyewear may reduce the brightness of oncoming headlights, they still reduce the amount of ambient light your eyes are receiving, which may reduce your overall night vision. Keeping your windshield clean inside and out and dimming your dash lights will also help reduce the blinding effect of bright headlights and improve your night vision.